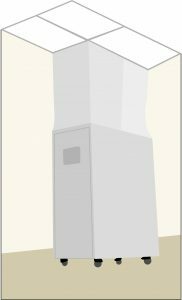 A mobile dust containment unit is a mobile work area that traps dust generated by renovation and maintenance activities above ceilings in sensitive environments, like hospitals. Mobile containment units are used to minimize patient exposure to dust and infectious agents that may be generated and/or released during routine building operations and unplanned events performed by facility personnel and contractors. The mobile unit is moved to the work location, and extended up to the ceiling to create a sealed environment while work is completed. HEPA filtered air scrubbing machines are used with mobile containment units to create a negative-air environment within the mobile work area. That means that air and dust are being sucked into the mobile unit, instead of being pushed out. A negative-air environment ensures that dust and other harmful agents cannot escape from the mobile unit and spread into sensitive patient areas in the hospital. When used properly, mobile dust containment units have proven to be an effective, time- and cost-saving infection prevention measure for daily hospital operations and maintenance activities. 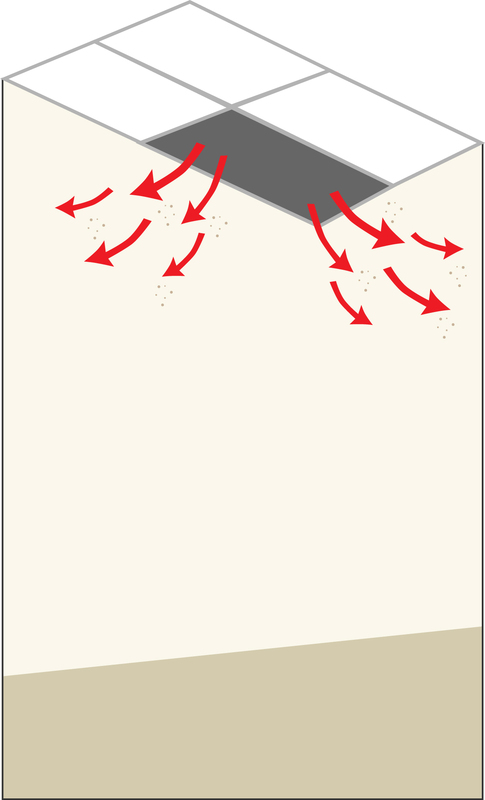 Above-ceiling areas are home to major dust and other bio-hazards. Without a mobile dust containment unit, these particles can escape into work zones or other patient areas and be transported throughout the hospital. Why use a mobile dust containment unit? The primary reason to use a mobile dust containment unit is that it can reduce the risk of hospital-association infections (HAI’s) associated with facility maintenance and renovation. That said, mobile units are just one of many control measures available to you. For example, temporary barriers are often set up around an entire work area for longer-term renovation and construction projects. These barriers should be combined with HEPA filtered negative air machines to control dust, and laser air-borne particulate counting to evaluate effectiveness, and other control methods to ensure patient safety. But when it comes to minor upgrades or maintenance tasks performed above ceilings, mobile containment units can save time by eliminating the need for setup of barriers around the entire work area. Furthermore, they minimize the need to adjust standard operating procedures, like traffic flow and HVAC controls. When should you use a mobile dust containment unit? Mobile containment units allow for temporary containment of small work areas above ceilings. This means they are ideal for minor utility upgrades, cabling, fire stopping and maintenance work, and situations where multiple work areas or access points are needed above a ceiling. They are not meant for extensive renovation work or longer-term projects spanning several days. You should work with an infection preventionist and environmental specialist to conduct an Infection Control Risk Assessment (ICRA) for any planned construction, renovation or maintenance work in your facility. They can help identify when and how mobile dust containment units can safely be utilized to complete work while limiting risk of patient exposure. When used correctly, mobile units can significantly reduce the expense, time spent and inconvenience caused by more permanent containment and infection prevention measures. Mobile dust containment units with ceiling access seal off above-ceiling work areas to prevent the spread of dust and protect at-risk patients from hospital-association infections. What contaminants can you control with a mobile dust containment unit? In a word: dust. But also everything that lives on, feeds on and travels via dust particles. You might be surprised by the extensive list of bacteria, viruses, mold spores and other infectious agents that inhabit dusty environments. Mobile containment units are especially helpful for accessing high-dust areas—like above-ceiling spaces—that tend to collect dust and cultivate bacterial growth over long periods of time. When it comes to mobile containment systems, you generally have two options: soft-sided or hard-sided. Many variations of these two systems are available on the market. Take time to make a wish list of features and find a unit that will work for your facility and project needs. Remember, the goal is to find a unit that will make your job easier; not harder. Construction usually includes an adjustable or collapsible metal frame, covered with a woven fabric or synthetic (nylon) cover. Soft-sided units are generally less expensive than hard-sided options. Can be difficult to clean (wipe down or vacuum). Fabric can collect dust and debris in folds. May be prone to rips and tears in fabric enclosure. Review set-up instructions; may require two people to set up. Usually hard sheet metal construction. Oftentimes still have a “soft” fabric attachment at the top for ceiling access (so it can still fit through doorways). Fabric attachments may be curtain style or zippered. Generally easy to wipe down and clean after use. Oftentimes include room for storage of tools, including ladders, to minimize trips in and out of unit. Some units include built-in negative air machines with HEPA-Filters (High Efficiency Particulate Air). Avoid designs with lots of crevices that may trap dust. You’ve likely heard people use these terms interchangeably. So what’s the difference? “Mobile containment unit” is the most general term and refers to any type of mobile dust containment equipment that can be moved to various locations and used to contain dust. 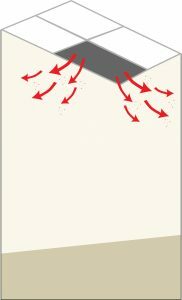 You may have also heard people use the term “ceiling access unit,” which refers to a mobile containment unit with the ability to reach up to and seal off above-ceiling work areas. Similarly, many units are also equipped for “wall access containment”. 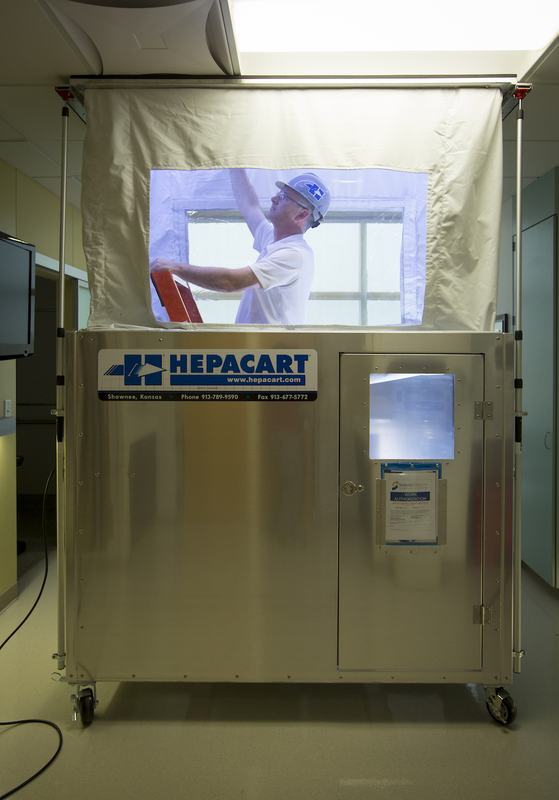 “HEPACART™” is a brand name of mobile dust containment units that is sometimes used as a generic term in the infection control field; much like we use “Kleenex” to refer to tissues. However, the term HEPACART™ refers to a specific model of mobile ceiling access unit that is equipped with an embedded negative air machine and HEPA-Filters (hence the name and common confusion). This brand of units is considered a “ceiling access unit” and is also lab-tested for effectiveness. Many models of mobile containment units and ceiling access units do not have these features, so be sure to investigate any units you’re thinking about purchasing or renting if you want these features included. Need help finding a mobile dust containment unit? Contact us at info@amienvironmental.com.